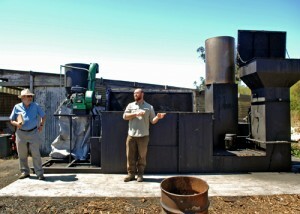 In May 2012 the Sonoma Biochar Initiative (SBI) organized a pilot biochar distribution program called the Citizen Science Project. Modeled after the pioneering Big Biochar Experiment in the UK, our main goal was to get biochar into the hands of local gardeners, thereby building awareness and practical, hands-on experience with biochar in the Sonoma Valley community. There is also the opportunity to collect data on the use and effectiveness of biochar in local soil types, and to contribute this data for inclusion in the UK project results. With the help of students and faculty from the Sonoma Valley High School Ecology Club and a kind donation of compost from awesome folks at Sonoma Compost, we distributed 40 bags of biochar/compost mix and 40 bags of compost to 29 individuals and 11 sets of material to the director of the Sonoma Valley School Garden project for use at area elementary schools. Instructions on how to implement the experiment were given out to each participant. In February 2013 SBI received funding from the Mental Insight Foundation to expand the Citizen Science Project, and preparations are underway to distribute 200 + bags of biochar on April 20th. We believe the Citizen Science Project is one of the best ways to teach people about the benefits of biochar and to gather real-world data and buy-in from the general public regarding its use at this early stage of the biochar industry’s development. If you are interested in taking part in the 2013 program, and you are local enough to be able to pick up the biochar from a Sonoma County location, please contact us at: raymond@sonomabiocharinitiative.org. Please use “Citizen Science Project” in the subject line. We will contact you to let you know when and how to pick up your bags. If you are interested in volunteering to help with the project, please also let us know. Go here (Citizen-Science) for more information. The Sonoma Biochar Initiative, in cooperation with the Sonoma Ecology Center, planned and hosted the 2012 United States Biochar initiative Conference at Sonoma State University from July 29th to Aug. 1st. Some 500 biochar scientists, academics, students, vendors, and enthusiasts, as well as environmentalists, farmers and ranchers, government agency representatives, financial experts, and the press came from all parts of the Bay Area, the United States and 15 countries to attend part or all of the activities. A delegation of 15 policy and science representatives from the People’s Republic of China, on the last stop of a biochar-related tour of the U.S. sponsored by the International Biochar Initiative, attended the full conference. They graciously hosted a special luncheon for SBI members and local policy representatives, presented on current Chinese biochar research and activities, and stayed in the Biochar Village on Campus to cross-pollinate ideas with other conference attendees. Attendees who also travelled great distances included Ph.D. student Joy Ubah from from southeastern Nigeria and entrepreneur Craig Sams from the UK. The conference opened Sunday night with a wine and cheese reception where attendees could mingle while sampling a wonderful array of local wines, cheeses and other bites. Ray Gallian of SBI gave a heartfelt welcoming speech and well-known biochar gadfly Erich Knight followed with a witty, poetic and memorable treatise on biochar’s importance and potential in a carbon-challenged world. Each morning attendees were treated to plenary presentations given by some of the top players in the biochar industry, including researcher Johannes Lehmann of Cornell University, David Laird of Iowa State University, and SBI’s own Peter Hirst of New England Biochar (to name just a few). In the afternoons, breakout sessions were featured covering the latest academic research, applications, and issues affecting the economic viability of the emerging biochar industry. Special FarmOut tours took attendees to local farms (including Greenstring, Tara Firma, and Valley End) to highlight the challenges and successes of integrating biochar into their workflow. Monday night’s screening of the fabulous movie “Symphony of the Soil”, which packed the Evert Person theatre and brought in many people from the local community. The “Financing Biochar” session that presented traditional and emerging financial options for biochar entrepreneurs to a standing-room-only crowd. The Gala Dinner, which featured wonderfully prepared local food from caterer Sally Tomatoes, excellent wines from our many local winery sponsors, and a sobering keynote speech on the perilous future we face from the convergence of peak oil, peak phosphorous, climate change and overpopulation provided by Richard Heinberg, Senior Fellow-in-Residence and Board Secretary of the Post Carbon Institute. Mr. Heinberg also showcased his excellent musical skills as part of the classical trio that played during the event. By all accounts the conference was a huge success that showcased biochar on a local, national and international stage, provided a forum for the cross-pollination of diverse ideas, and enlarged the biochar network. SBI’s Board would especially like to thank all of the speakers who gave their time, knowledge and financial support to the conference—often at great personal sacrifice, our Commercial Sponsors who also provided critical financial support, the 20+ volunteers who gave their time and dedication—often behind the scenes—to help make this the best biochar conference yet, and our Master of Ceremonies, Genevieve Taylor, who kept the proceedings running smoothly. And lastly, I would personally like to thank the SBI Conference Committee who selflessly dedicated hundreds of hours each to the planning and implementation of this event with no remuneration other than to see biochar use and education flourish. This was an incredible opportunity filled with challenge after challenge, and you all performed with enthusiasm and professionalism. With drought conditions upon us in Sonoma County, SBI and the Sonoma County Water Agency are jointly seeking ways to use biochar effectively to control runoff on farms and to preserve water more efficiently in the soil.